Bakari wanted to know how I did my visual book reviews. Here’s how! Over the past year, we’ve checked out an average of 13 items a week from the Toronto Public Library each month. I select books by browsing through the library’s new releases list or searching through their collection for a particular topic I want to focus on. I sometimes reach out to publishers and authors if I hear of an interesting book (particularly books related to visual thinking), and some reach out to me because they’ve seen some of my visual book reviews. In addition, I receive one or two books a month for review. I skim through most of the books I get, since many repeat things I’ve already read in other books. When I’m conscientious, I mark pages with book darts or strips of paper. Sometimes I just dogear them and then donate to the library to make up for my guilty conscience. I don’t write in books, especially not library books. I prefer to keep highlights on my computer, where I can search them and reuse them easily. I usually draw while reading the book for the first time. I’ve tried drawing on my second read-through, but I find many books boring if read again so quickly after the first time. I read the table of contents to get a general sense of how the book is laid out. Then I read through the book, holding the book open (or paging through it on my tablet if I’m reading an e-book, which I’m coming to prefer) while writing down key points in my tablet PC and doodling little illustrations. I erase, resize, and move things around as needed so that there’s space for everything I want to remember. 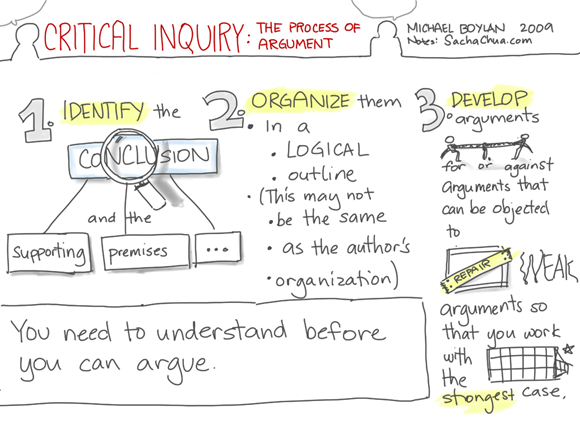 Then I post the notes to my blog and add them to my public Evernote notebook so that I can find them again. I release my book reviews under the Creative Commons Attribution License (with attribution baked into the image! =) ) so that people can freely share them. Many people don’t have the time or inclination to read. I read a lot. I enjoy reading, and it helps me learn so much more than I could have figured out on my own. I’m so lucky to be in a city with an amazing public library system, and to be alive in the age of the Internet and e-books. If I can learn as much as possible and share as much as I can (perhaps in more useful or engaging ways than a book that needs an hour or two to read), then that’s another way I can give back to the world. And I learn a ton along the way! After a great day at work, I bundled up against the cold and squeezed into the rush-hour crowd on my way to to the MaRS Startup Book Club at 101 College Street. I wondered if it would be like The Jane Austen Book Club or more like the 400+-person entrepreneurship events I’d gone to at MaRS. I didn’t know what to expect. I think it was my first book club meeting ever. I’d gone through my emergency stash of business cards at an unexpected clip, and I still hadn’t gotten around to experimenting with Moo-based sketchnote cards. 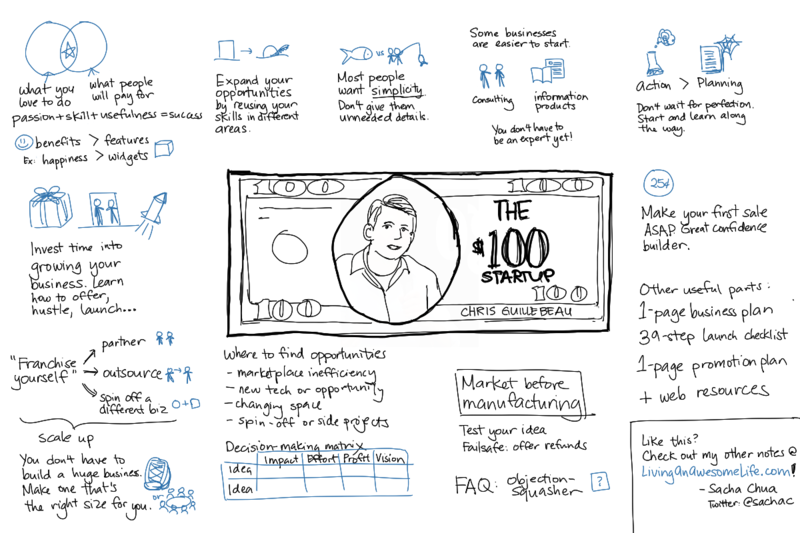 On a whim, I footed it to a nearby shop and got a hundred copies made of my sketchnote of The $100 Startup. 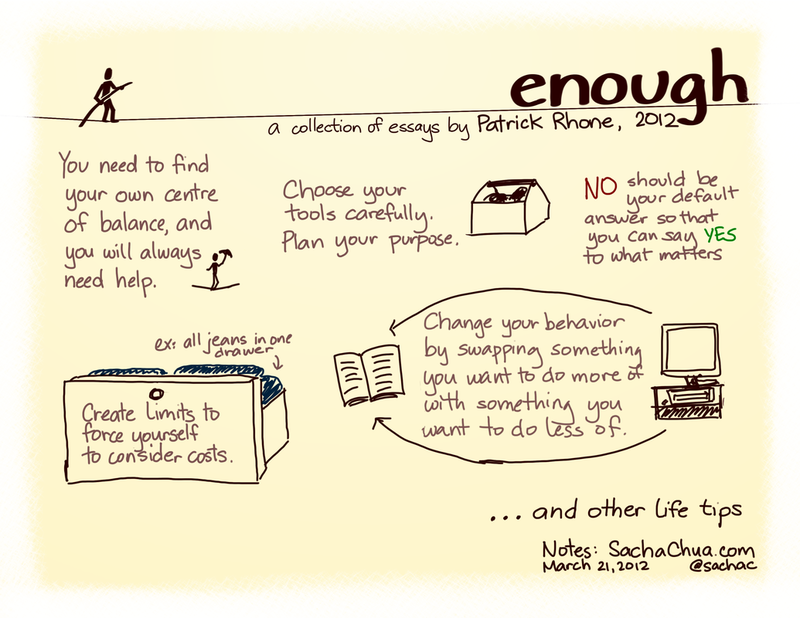 I figured that since we were going to discuss the book, my sketchnote would be a handy thing to give to people instead of a business card. Fortunately, I’d had the foresight to include contact information on the sketch. Still-warm copies stashed safely in my bag, I dashed to MaRS a few minutes late. I found the room at the back of MaRS and walked in slightly breathless – to find my sketchnotes preceding me, printed out on individual large sheets (11”x17”?) for each attendee. Did that ever send me over the moon! It was fantastic! We started with a round of introductions coupled with favourite stories from the book. For me, looking at the fish drawing reminded me right away of that point that sometimes you shouldn’t teach a person to fish, you should just keep it simple and give them the darn fish. We talked about joint ventures and strategic alliances. We talked about delegating. We talked about testing ideas and dealing with failures. We talked about building confidence. And boy, were there ever so many book recommendations… I recognized some of the books like Predictably Irrational, and many were completely new to me. Fellow bookworms! 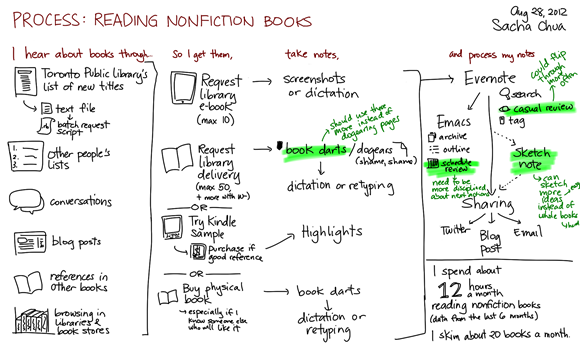 Other people who fill index cards and type notes with thoughts and quotes and ideas from books! I think I’m going to have so much fun swapping notes with people. 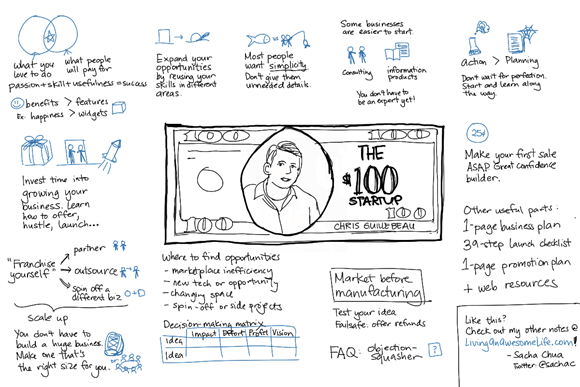 It was generally agreed that The $100 Startup was an easy read, the kind of thing you’d give to people who are interested in starting their own business, but perhaps less of a recommendation for people who are already neck-deep in the Startup Owner’s Manual or things like that. I’m a relative newbie (I’m only just getting to apply those things I’ve been reading about for years! ), so I got a lot out of this book, and I’ve been experimenting with the ideas in it. You know that feeling you get when you stumble across somewhere you actually, surprisingly fit in? Your tribe? I think this might be another great tribe to belong to. =) I have sooooo much to learn about business, and I think this is a great place to start. Thanks for organizing this, Keri Damen and Marielle Voksepp! Can’t wait to get to know the others and to read the next book. Interested in joining the book club? There doesn’t seem to be a separate LinkedIn group for it yet, but you can probably reach out to Marielle over Twitter and ask to be added to the mailing list. I like drawing about how I do things. 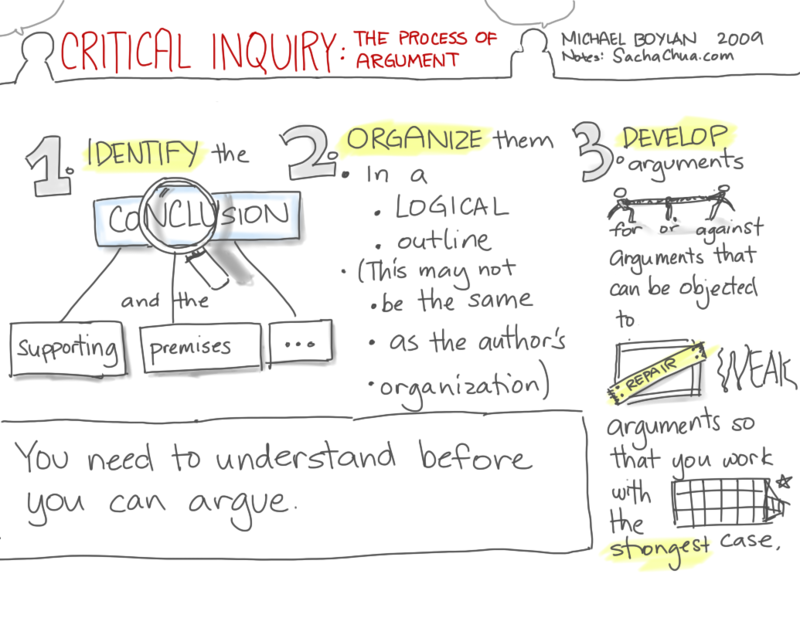 It’s more fun than describing the process with text, and I can annotate it with opportunities for improvement. enough is a collection of essays by Patrick Rhone on the idea of having enough. He compares it to the dynamic process of balancing on a tightrope, where you have to find your own centre of balance and you’ll always need some kind of help – stretching your arms, using a bar or an umbrella, and so on. In addition to reflections on minimalism and limiting life to make it comprehensible, he includes thoughts on technology, tools, behavioural change, and other life tips.